I am so pleased to be linking up with Ryobi Power Tools for this very special Christmas Giveaway. Throughout the festive period Ryobi have been giving away products from their One+ cordless power tool range along with their fun Christmas Jumpers. 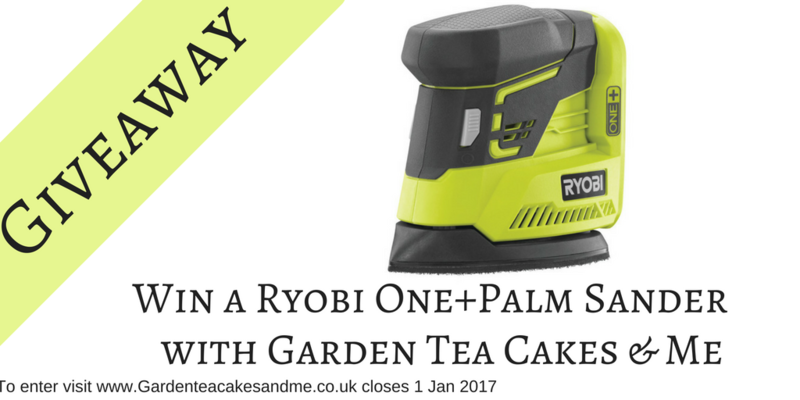 So I am delighted that Ryobi are offering a Garden Tea Cakes and Me reader the chance to win a 18V Cordless Palm Sander R18PS-0 from the One+ range, a charger and 18v 2.5 AH Lithium battery worth £159. The ONE+ cordless technology offers reliable and powerful power to your Ryobi tool of choice. 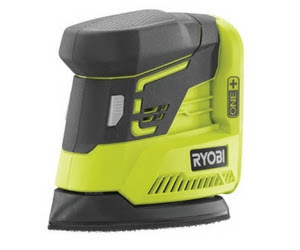 Once you have a charger and battery pack it will interchange with any of the power tools is the Ryobi ONE+ range. The palm sander is the perfect tool to help with any DIY projects you may have planned in the new year. Or maybe you are a lover of upcyling furniture, and have some old dark wood furniture you want to breath new life into. I transformed my storage unit in my craft room. I was impressed earlier this year with the Ryobi ONE+ Cordless Hedge Trimmer, the rechargeable battery powered hedge trimmer was a real winner which just kept on going. To be in with a chance of winning this lovely prize confirm your entry/entries using the Rafflecopter competition widget below. Just login or register with your email in the widget below, you can get extra entries by completing the additional tasks. Come back every day to get an extra free entry! Closes 1 January 2017. Winner must respond within ten days of being notified, after which time a new winner will be selected. UK entrants only. For Terms and Conditions click the link on the Rafflecopter widget. If any of the links are not working on the widget leave me a comment on this blog post or tweet me. What a wonderful giveaway, it would certainly be amazing for some of my projects. Ooooh this is fab. I could totally do with this to finish off my DIY jobs. I love a good power tool. Thanks for letting me know Simon, I've updated the link. Good luck with the comp! It's best to have the best!